﻿"I passed my BPI BA exam with a 92%. Thank you for the practice test and study guides." ﻿"I can find facts all over the internet, but guidance and advice from someone a few steps ahead is invaluable!" ﻿﻿"The information I found on your web site was more useful than the class room instructions I received"
One exam per person, or get your whole company in at a great discount. Note: leave your browser window open after payment is submitted for download instructions. 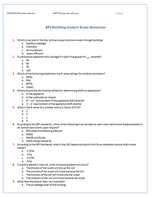 BPI Building Analyst Certification Practice Exam Questions: 100-question multiple choice practice exam with answer key at the end of the exam. Free Bonus Item #1: Energy Auditor Field Sheets, time tested and refined for over 5 years and the same field sheets my auditors use. If you are working for a company doing audits after a month or two of experience, sit down with the owner and offer suggestions from these field sheets to add value to the company and propel your career. 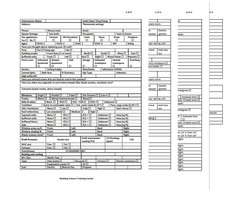 If you are a business owner use these field sheets to help smooth the transition from auditor to crew as you grow your company. The experience and refinement put into these field sheets will pay for itself in time saved, go-backs and jobs sold 100x. 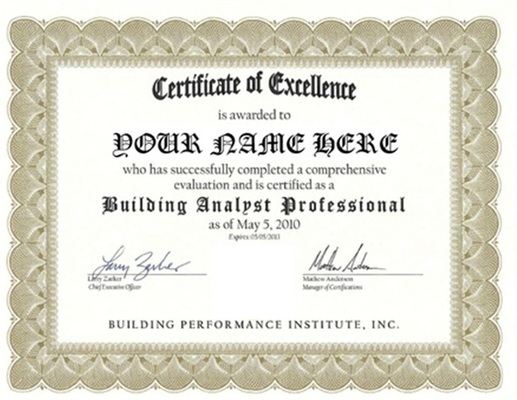 BPI Building Analyst Certification Field Exam Video Walk-Through: Have instant, 24-7 access to a mock BPI Field Exam that would pass an actual BPI Field Test. This video shows exactly how you should "think out loud" during your BPI Field Exam and exposes what questions a BPI Field Proctor might ask during an actual exam so you aren't caught off guard. 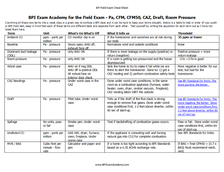 Free Bonus Item #1: BPI Field Exam cheat sheets for your open notes field exam. Having months of materials thrown at you in 5 days is not the best way to get a deep understanding of what you are actually doing. Use these cheat sheets as a reference during and after the BPI Field Exam as a quick reference to help straighten your path to second-nature understanding so you can concentrate on where the problems are not the logistics. Free Bonus Item #2: Top 5 Ways to Quickly Fail the BPI Field Exam Checklist. The BPI Field Exam is more often failed than the Written Exam. Don't start off on the wrong foot by making unconscious mistakes you only realize after the exam is over. Take this guide with you into the exam as a fail-safe to ensure you don't make these simple mistakes that could stand in the way of your BPI Certification. Or Save & Get Them Both For $36.95!